As the Washington National Cathedral rose above the surrounding landscape, the pealing of Carillon bells signaled our approach. Every Saturday at 12:30 pm the carillonneur makes his ascent up 150 limestone spiral steps to arrive at the highest point in Washington DC, the central tower, reaching 301 feet towards the sky. Sitting at the keyboard, looking out at some of the most stunning views of the city, this talented musician is surrounded by 53 Carillon bells, the largest weighing 12 tons and almost 9 feet in diameter, the third heaviest in the world. The sounds he produces are nothing short of angelic and we were thankful our timing was spot on to give audience to this beautiful melody. 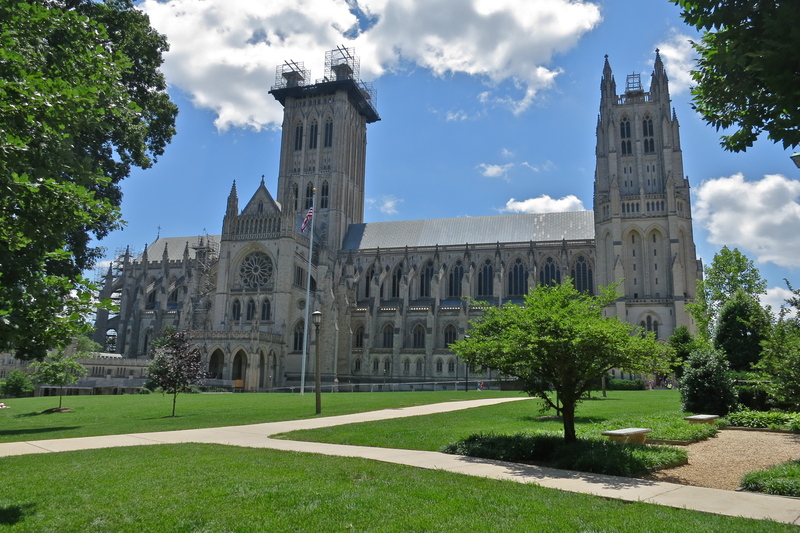 While most of us know this majestic landmark as the Washington National Cathedral, its official name is the Cathedral Church of St. Peter and St. Paul and it has been “called to serve as the spiritual home for our nation”, welcoming all faiths. It is the 6th largest cathedral in the world and the Cathedral of St. John the Divine in New York City is the only cathedral in this country that is larger. Made principally of Indiana limestone, it is an architectural marvel and each element has a story to tell, from the lovely gardens to the stained-glass windows, to the gargoyles stationed around the property. The flying buttresses, pointed archways, large windows, and ribbed vaulting proudly display the traditional Gothic design. The first foundation stone for this lofty undertaking was laid in 1907 in the presence of President Theodore Roosevelt and the final finial was set in place 83 years later to the day in 1990, under the watchful eye of President George H. W. Bush. The National Cathedral is the location of funeral and memorial services for almost all the 21 U.S. Presidents since 1893 and many Presidential Inaugural Prayer Services are held here. More than 220 people are interred beneath these towers, two notables being Woodrow Wilson and Helen Keller. 231 stained-glass windows honoring important people, spiritual leaders and important achievements. The Space Window displays a piece of lunar rock in an air-tight nitrogen-filled capsule. 112 gargoyles (my favorite). A Darth Vader sculpture sits atop the northwest tower. The Great Organ consists of 10,650 pipes. $65 million was raised, all in private donations, to complete the Cathedral. Today scaffolding sheathes the Cathedral silhouette, the result of an 8.5 magnitude earthquake that rocked the east coast on August 23, 2011, sending cracks through the flying buttresses, toppling gargoyles and finials, and punching a hole through the roof. The central tower is encased in a metal framework and metal netting has been draped inside, around the top of the tower, to prevent stray stones from causing further damage. Unfortunately, all this metal now covers some of the magnificent stained-glass windows, but many can be viewed here. The largest of these windows is the North Rose Window, a stunning 26 feet in diameter, depicting Judgment Day. The Washington National Cathedral tells an iconic visual story, woven throughout its stained-glass windows, carvings and tapestries, the movement of mankind from creation to redemption. I only wish we’d had many more hours to explore her many facets. Oh LuAnn: We have missed this piece of history the last time we were there in DC… Will definitely put it on our “to see” places the next time we go to DC…Thanks for the small taste of history. My pleasure. It has been one of our favorite places to visit in DC. Thanks Ingrid. We love to tour cathedrals as well. When we spent a year in Mexico there were so many beautiful churches to visit. Beautiful, I feel like I was there again. It is already decades since I last saw this beautiful cathedral. Thanks for bringing it back to life with great shots and details. My pleasure MonaLiza. I can’t believe I lived near here several years ago and this was my first visit. What a great post! I didn’t see the cathedral, when I visited there, but I do love old, beautiful churches. It was great to get so much information about it. AND, of course, great pictures. Thanks, LuAnn. I’ll have to look up gargoyles, because I don’t know what the purpose of them is. Thanks Joan. Gargoyles have been purported to protect those inside from evil spirits. I love gargoyles! There is a gargoyle tour at the cathedral scheduled for Jun 28. Wish we could attend it. I did look up gargoyles, and what you said is true for the Catholic church, but they are also used as drain spouts, to drain rainwater from running down the sides of the buildings, for non-Catholic churches and other buildings. I have been there twice and still have yet to see all of this lovely place. Love love LOVE your cover photo. And what an inspiring post this is. I had absolutely no idea about any of this — such massive holes in my knowledge of our country! Thank you for this wonderful post. You’ve got me thinking about itineraries…! What absolutely stunning photos! Superior job!! I remember when we visited the Cathedral. I just sat and stared. It just took my breath away. Thanks Marsha. Everything about this cathedral did the same to me. LuAnn what an amazing cathedral and I had never heard of it. The description of the bells being played sounds angelic indeed.Your photos really give a wonderful sense of the place. Thank you for the tour. Another stunning header! Such a great post about this marvel of architecture. I’m so glad you’re getting to see all these sites while you have the chance! Thanks Gunta! This was a wonderful way to spend a few hours. The carvings, gargoyles, and stained-glass windows were exquisite. A fantastic gallery of images Luann, including the superb header shot. The magnificent cathedral looks like like it could give any older, European counterpart a run for its money. Given the musician you are Sylvia, you would love the Carillon bells. What a lovely tour, LuAnn — every time I start to question our plan of traveling up the east coast, I receive one of your blogs, and I feel inspired again to make the trip. Your header photo is stunningly beautiful — wonderful composition and lighting. You have a great eye! Thanks Laurel. If you make it to DC, I think this is a must-see. Good word that is majestic. And your images look like something they should use for their pamphlet. Luann, these are one of your best sets of images. Perhaps we got used to your nature posts that you taking an incredible incredible incredible shot(s) at architechture makes it so astounding. I wish to see this majesty. Thanks so much Rommel and here I was worried about these shots because the lighting was bad inside and the sunshine so bright outside. If you ever get to DC, this should be on your list. I would love to take the gargoyle tour. Hi LuAnn, You post brings the majesty of the National Cathedral! Thank you for posting the facts and historic information. Great read and images are stunning. Oh boy…another item to put on the bucket list. The stainglass just breathtaking. It is a beautiful place to visit Laurie. Ooo, I love me some Gothic! Darth Vader is a nice touch as well…I do wonder why you are not writing a travel book my friend, you have the eye for the photos and the facts and the personal touch…I am sure I am not the first person to mention this…so you kind of have too now…in fact you are committed to doing it, I have just decided. It is certainly something to ponder. Thanks Ste J.
Luann I love your way of showing so much on your blogs! I am sorry to hear that the ticks are bothering Terry so much, but we know that they are a problem all over the east. When we were there last summer we had to watch every time we were outside. Lots of checking for those little insects. I loved your blog about NYC too. Sounds like you are enjoying your time. Have a Happy July 4th celebration too! Nice & lots of detail!